I have been waiting for the arrival of these products with as much anticipation as a Harry Potter fan. Eversince I got my hands on K Palette's 24 hour tattoo liners, I have not been able to put them down and I have been wishing since then for a mascara to arrive that will match the performance of my lasting 2-way eyebrow and tattoo liners. A few days ago, my wish was granted when these babies arrived at my doorstep. Say hello to one of Japan's most popular Mascara brands, Fairydrops and of course, the beloved K-Palette 1-Day Lash Perm Tattoo Mascara. Fairydrops was born out of necessity. It's CEO and founder Aya Yasuda, used to be an anchorwoman of Major League Baseball on a local tv station in Los Angeles. Being born with Asian eyes, she longed for the big, photogenic eyes that her co-workers seemed to posses until one day, she realized that it was the long upward slopping eyelashes that made the difference. This led her to months of research and experimentation with different brushes and formulas and eventually, the discovery and creation of the 3-teardrop wand which Fairydrops is now infamour for. 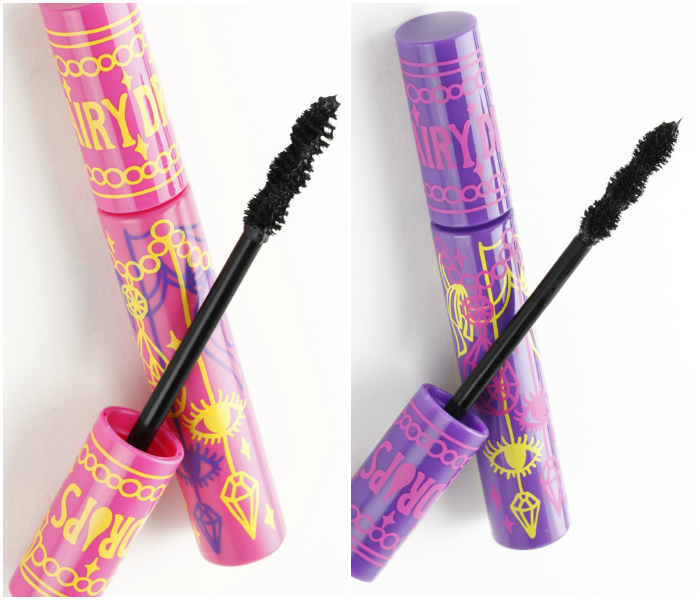 The 3-teardrop wand manages to catch and lift even the shortest of lashes! 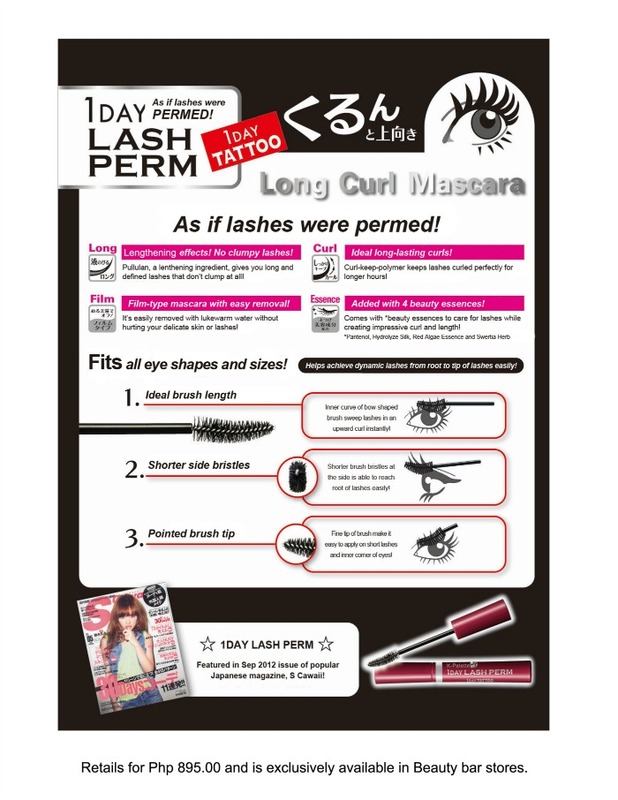 Perfect for people like me who were born with a "lash deficiency" (lol, seriously, my lashes are so short, some professional MUA are afraid to curl them). 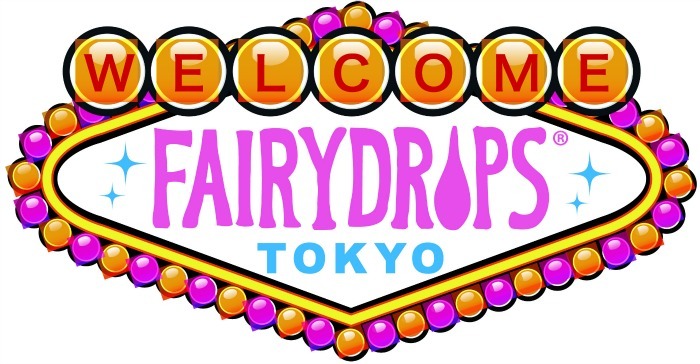 Fairydrops come in two variants, a pink film type and a purple waterproof mascara. Based on my experience with the K-Palette tattoo liners, I find that the film type variant works just fine for my needs. It doesn't smudge even after an entire day of sweat, natural oils and spotlights on my face. I am all for the film type type because it comes off completely with just soap and water. It leaves no residue whatsoever and it is this hassle-free reason plus the fact that it stays on no matter what is why I am totally in love with the product. However, if you're iffy about taking chances or are planning to be in the water all day, then I suggest you go with the purple/waterproof. It's perfect for beach getaways. Anyway, it doesn't really matter which of the two you choose since the end product guarantees a flawless, clump-free application each and every time. Moving on to K-Palette's 1 Day Tattoo Lash Perm Mascara. K-Palette has earned a place in my heart as one of my top 3 most favorite make up brands. The reason why I love K-Palette so much is because they manage to make dummy-proof products that apply flawlessly even for the most inexperienced user. I am confident enough to say that their eyeliner is one of the best I've ever tried in the market and the same is true with their mascara. Like the eyeliner, it washes of completely with just soap and water which is a big plus for me because I hate rubbing my eye area with make up remover. (I heard somewhere that constant rubbing creates not only wrinkles but dark circles as well). K-Palette's 1 Day Lash Perm is not only gentle on your skin but it also conditions your lashes while keeping the perm all day. It doesn't clumo at all. And because it was created by Asians, the brush is a perfect fit for our eye shapes. The fine tip makes it possible to reach even the inner corner of our eyes and short lashes. Bright eyes and beautifully upturned eyelashes take years of your face, do yourself a favor, head to Beauty Bar and try these new products out for yourself. I personally guarantee that you'll fall in love with them upon first application. While you're at it, check out the K-Palette Tattoo Eyeliners, 2-Way Eyebrow and Okuna Concealer as well. These 3 will make your life a lot easier.